President Cyril Rampahosa signed the Taxation Laws Amendment Act into law on Wednesday, enacting a large number of small, technical, and mostly routine changes to South Africa's tax regime. 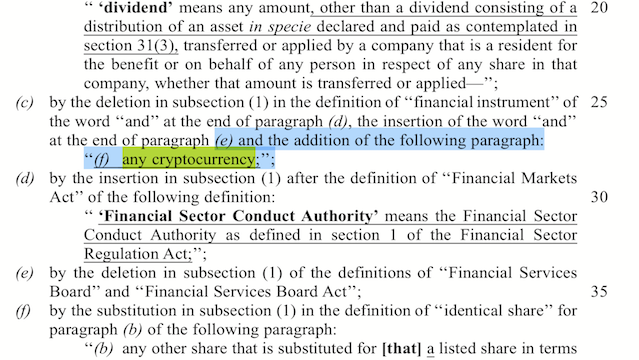 Amid the 132 pages of updates are three small references to cryptocurrencies. For purposes of tax law, cryptocurrencies are now "financial instruments" – and losses made trading in them are strictly ring-fenced. Cryptocurrencies such as bitcoin and its peers became "financial instruments" for the purposes of tax law on Thursday, after publication of the Taxation Laws Amendment Act. The 132-page law, dealing with a large number of small, technical, and mostly routine updates to laws going back as far as 1962, was signed by President Cyril Ramaphosa on Wednesday. The law contains only three brief mentions of cryptocurrencies, but those have now changed the way such instruments – which the Reserve Bank prefers to call crypto-assets or crypto-tokens because it does not consider them currency – are treated. As financial instruments, cryptocurrencies now fall into the same basket as promissory notes, futures contracts, and derivatives based on underlying commodities. For tax purposes, the value of such instruments are determined by the price that could be obtained in an arms-length transaction on the open market. A separate update, to Section 20A of the 1962 Income Tax Act, lists cryptocurrencies alongside such activities as dealing in collectible items, showing animals in competitions, and betting on sports: economic activities that may involve lots of money, but may also not be conducted on an actual business basis. "With the inclusion of cryptocurrency in S20A, cryptocurrency trade will now be posed with a differentiation between losses resulting from the actual trading activities of a taxpayer, and the losses resulting from what could be perceived as the taxpayer’s hobbies or lifestyle activities," says Jessica Carr, an associate in Cliffe Dekker Hofmyer's tax and exchange control practice that has been watching the legislation. That hobby status means that losses made trading cryptocurrencies may not only be offset against profits made trading cryptocurrencies; taking a big bath in a bitcoin transaction will not allow you to reduce the amount of tax you have to pay on any other income. That restriction only applies to natural persons, but comes with an "escape clause" for those who genuinely engage in what the SA Revenue Service (Sars) deems to be commercial activity. Previously Sars simply treated cryptocurrency transactions by individuals as part of normal course of business, with trading gains or losses forming part of income or being treated as capital gains, depending on whether it was bought to trade in or as investment.